COME JOIN US TODAY FOR A LITTLE PIECE OF HISTORY WITH A SMILE! Since undergoing extensive renovations, the Hamilton Hotel has become a complete entertainment destination and is now even more popular with locals and tourists. Located between the Brisbane CBD and Brisbane Airport, this iconic, 1865-built hotel offers delectable food, a refreshing variety of beverages and outstanding service in a trendy atmosphere. The venue includes four tasteful bars over two levels, a restaurant, bistro, children's indoor entertainment area, gaming facilities, TAB, music events, sports viewing on the big screens and two elegant function rooms. Our Gaming room features 45 of the latest gaming machines, Keno terminal, and link jackpots including Lock-it Link, Lightning link ($10,000+) and Dragon Link ($10,000). With exceptional service, and plenty of major promotions, we're the place to be. We have the latest Ticket in Ticket Out system operation on 100% of our machines allowing you to move quickly and easily between machines. All of our machines pay up to $5,000 as a ticket so their is no waiting for cash. To add to your experience we provide complimentary soft drink and coffee for machine players. For those who would like something else, we also have an easily accessible Gaming Bar with a wide range of drinks and snacks available. Our comfortable Keno lounge area is ready for you to watch your numbers come up and play along with your friends. A chic, intimate getaway for those in the know, H Lounge is the ultimate in exclusive socialising. The perfect haven from the everyday nightlife experience. Golden plush lounges, rich and cozy booths create a lush, inviting ambience and relaxing VIP area ideal for unwinding. Home to an elite community of the highest profile personalities, athletes and artists looking for the latest music and a night that fulfills their every need. H also accommodates for the more vibrant personalities to dance the night away. With plenty of seating both inside and outside, the bistro bar area combines both class and ambiance. Located in the restaurant, we offer a more relaxed styled atmosphere to enjoy a glass of wine while with friends at the bar or out on the bistro deck with a group. We provide heating in the winter and shade in the summer, to ensure a pleasant experience while spending lazy days out on the deck. For sport lovers; come and watch all the big games at the newly refurbished Sports Bar. Complete with comfortable chairs and surround sound for major events, you will have one of the best seats in the house, no matter where you sit. The hardest part of your day will be trying to decide which beer you would like to drink, we have 17 draft beers available. 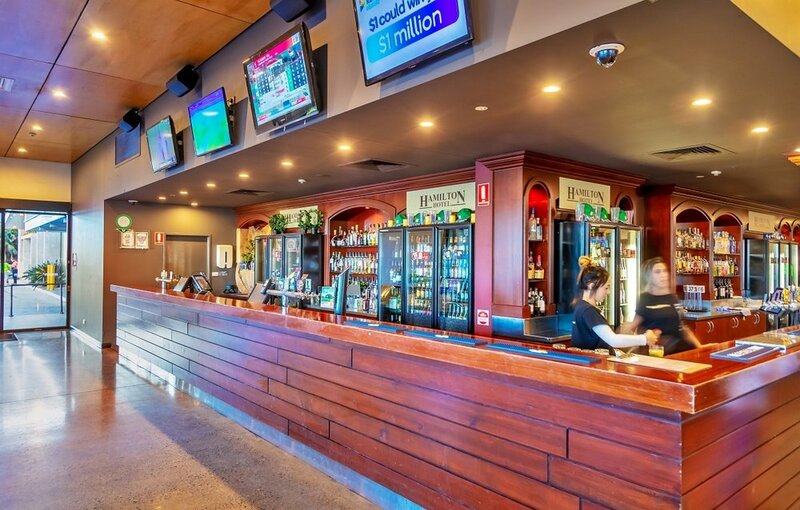 And for the betting enthusiasts , watch the races in comfort in our recently refurbished UBET area, fitted with 3 new Orion Terminals, 2 Self Service Terminals, portable tablets for Live Odds Betting, and new 65 TV screens so you won't miss a thing. Where else could you place your bets and get the latest news from local and international jockeys and trainers that frequent the venue when racing at the local tracks.